The Chiefs have posted a winning record in all four seasons with quarterback Alex Smith and head coach Andy Reid, but they’ve only won one playoff game. Last summer, there was some talk of giving first-round draft pick QB Patrick Mahomes II a shot instead of Smith. Mahomes, a Big 12 gunslinger, was a more exciting possibility than a game manager like Smith, but Smith quickly quieted any critics with a four-touchdown performance at New England in the season opener. With rookie Kareem Hunt appearing to be the greatest running back ever (at the time), Smith guided the team to a 5-0 start while utilizing an unconventional college-inspired spread-type offense. Kansas City is now 6-5, as Hunt and Smith have both faltered. Given a home game against a beatable opponent today, Smith completely failed to reassure anyone, while Hunt rushed 11 times for 17 yards against what should have been a flimsy Buffalo run defense. 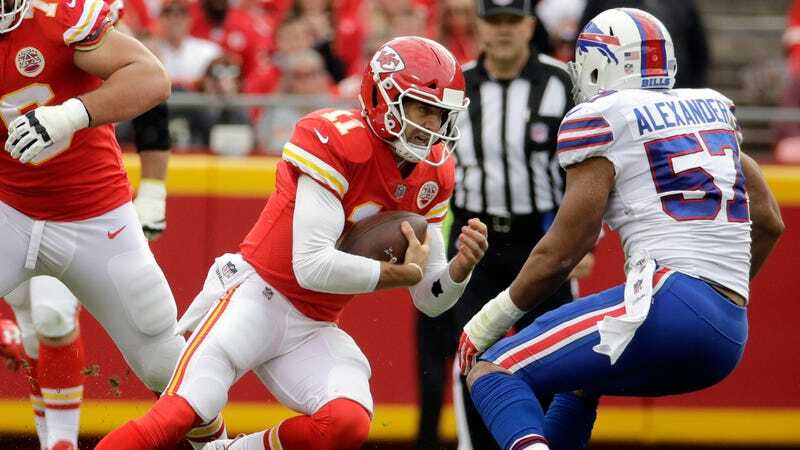 The Bills won in Kansas City, 16-10, and although the team reportedly has no plan to make a QB switch, Smith is floundering. He had an uninspiring 199 yards and one touchdown, along with a very bad interception at a crucial moment. That was Smith’s fourth pick of the last three games. Smith is playing better than he was when Jim Harbaugh benched him for Colin Kaepernick in the middle of the 49ers’ 2012 season—his ability to throw deep balls has slightly improved—but everything that the Chiefs were doing right in the first portion of the season has vanished. They’re not running the ball well, they’re not giving Smith protection, and their receivers have suffered injuries. In these conditions, there’s very little that a quarterback of Smith’s talent can give them. Even after the loss, Kansas City still leads the very bad AFC West, so there’s still time to figure it out. But Mahomes, who’s supposed to be the Chiefs’ long-term option, might be needed in the short term if the offense stays this stagnant in a very winnable division.